The second day of the Valdai Club Annual meeting began culturally with “Dostoyevskian psychology”, but in a good sense of the word. The session, which opened a series of expert discussions in Sochi on October 16, was devoted to national identity in a changing world. Without referring to the great Russian writer Fyodor Dostoevsky, there is a certain “political understatement”, as say the authors of the Valdai Club report, which was presented the day before. Vladimir Medinsky, Minister of Culture of the Russian Federation, set the tone of the discussion. “There is a winning spirit in our culture. We are extremely jealous of any offence against our sovereignty and react painfully when someone tries to solve our problems instead of us, ” he said. Developing the topic, the minister recalled the words of Sergey Karaganov, Dean of the Faculty of World Economy and World Politics, HSE, Honorary Chairman of the Presidium of the Council on Foreign and Defense Policy, who once suggested, that "Russia has two national ideas - defense and sovereignty." Perhaps this is the case, the minister said and added, that at the same time Russia is exclusively open, responsive, tolerant, and susceptible to everything alien because it is traditionally multinational. “Russia is universal, as our classics said,” Medinsky said, reviving the idea of Dostoevsky. Only a Russian has the universality, a mission to comprehend and unite in the future all the diversity of nationalities and to remove all their contradictions. In recent years, much has changed in the consciousness of society, and for the better. For example, there was a request for personal freedom - this is what once allowed Russia to become a great power. The division in the public mind into “Russians” and “Russian nationals” has ceased: all soldiers are Russians. For the first time in history of Russia culture has been included in the national priorities list. The main thesis of the minister, who excited the panelists and participants in the session, was the following: in Russian society and culture there is a request for conservatism. “People want spiritual and moral stability. The appeal of the Russian authorities to traditional values resonates with 90% of the population”, Medinsky said, starting the eternal intellectual debate between fathers and children about the benefits of the old and the harm of the new. Responding to the minister’s statement, Konstantin Bogomolov, director the Lenkom Theatre, said that innovations and traditions in art merge. Yes, there is a "new" art, which is attacking conservative values violently, aggressively. But one should not be afraid of the acuteness of their confrontation, because tension exacerbates perception. In the process of a talented, powerful attack fake values fall away, and genuine values require protection. At the moments of such an attack a person relives the values and realizes their necessity. Paradoxically, the aggression of innovation sharpens the taste for traditional values. “This is not a struggle between evil and good — this is a situation of growing global culture and consciousness, the maturity of humanity,” Bogomolov said, adding that the European culture is now deprived of this. Continuing the theme of the (Dostoevskian) universality of Russian culture, Bogomolov recalled, that according to Dostoevsky, any person has a great value. The writer never limited the complexity of thought: his characters love and hate equally. Hatred — according to Dostoevsky — is as powerful and sacred feeling as love is. According to the director, a person should have the right to hate, he should not only have the right to actions that limit life of another one. Europe now lives and looks like it is frightened of the free man Dostoevsky, as if it saw him awake and is scared, being convinced of his existence. Modern European culture is afraid of such persons. According to Bogomolov, the European fear generates censorship, and the reason is that the post-Nazi society forbids people to hate. As a result, the totalitarianism of love is flourishing in Europe: you cannot hate there, you can only love. In Russia, up to now, since the days of Dostoevsky this right remains - the right to madness. “A person is not a controlled substance, it is impossible to issue, complete, impose the rules of moral, spiritual life. This is totalitarianism of happiness, a strange utopia of universal love,” Bogomolov said. Therefore, in his opinion, the turn in the West to the right is logical. People say “stop”, they realized that they themselves want to choose - not only politicians, but also their feelings. Remember, Mitya in The Brothers Karamazov says to Alyosha: “Yes, man is broad, too broad, indeed. I'd have him narrower.” Here, apparently, in Europe, this quotation from a great writer was taken as the basis of life in society. James Sherr, Associate Fellow, Royal Institute of International Affairs (Chatham House), inspired by the analysis made by Bogomolov, complained: “For 30 years I’ve been joking about how Russia lives in totalitarianism; in Britain, I don't encounter it. But there I have to watch my tongue. If I come to a meeting at the institute, I cannot say a word more because I have to take into account how many representatives of sexual minorities and women are in the audience. I live with a feeling of anxiety, not feeling freedom. ” The scientist was so interested in the problem of the lack of freedom of Dostoevsky’s man in a changing world, that he invited the participants of the session to the UK to hold a discussion on this topic there. Many experts asked questions: What is generally acceptable for Russian conservatism today? Will this “social demand” result in the same “totalitarianism of love” that thrives in the West or even worse? Maybe after some time in classical novels dots will appear instead of politically incorrect words? And does Russia really need a return to conservatism? Natalia Solzhenitsyna, a well-known public figure, said that conservatism is necessary for confused societies, and the Russian society is properly such. But at the same time conservatism should be turned to tradition and open to searches. According to her, conservatism can often slide into barrage obscurantism, which prohibits any movement to novelty. This line is most noticeable in different understandings of patriotism. Touchy and suspicious patriotism finds problems in the intrigues of foreigners, puffy patriotism immoderately praises the nation. This kind of patriotism has a selective memory. But historical knowledge and understanding of history in its entirety saves us from curved roads, from wandering. Solzhenitsyna remembered the words (not of Dostoevsky, but of another Russian thinker) of the poet Fyodor Tyutchev, who said that Russia would die from unconsciousness. Similar examples in history already happened. But the sighted and sober patriotism carries the energy of development, and the tendency to isolate and weaken Russia in the world makes important the unity of society. Solzhenitsyna believes, that progress can be achieved with the help of two national principles - conservative saving and creative innovation. The dialogue about the Russian culture continued during the third session, but became more political: Cultural policy - do we really need it? Is it worth limiting the culture in its development and can it be done at all? On the one hand, in the period of the “crumbling world” culture can play a huge role in the formation of a new world order, on the other hand, originality and infinity do not allow it to be “moderated”. This session was held according to the Chatham House rules, we cannot give the names of the speakers when quoting them, but we can tell you what they were talking about. As one expert noted, culture develops on its own, but there are states and governments that can either help or hinder its development. The dependence of culture on the state is obvious, which means that it is an instrument of politics. Although some experts did not agree with this thesis, it was confirmed by the speaker, who cited a simple fact: literature, which for many years was out of focus after the collapse of the USSR, since the beginning of 2010 began to win back. This was accompanied by a process of society stabilization. Probably, literature (a huge component of culture) interacts best with a structured society. In 2014, the decline in circulations stopped and their growth began. Moreover, the quality of popular books has also changed: thrillers, love burgers, fantasy went down, interest in serious books is growing. Another participant said that the process of “self-regulation” of culture, which we are now observing, is much stronger than censorship and prohibitions of any kind, but the state policy in the field of culture should be developed, because the state should not support really destructive forms. But later he changed his mind and, contradicting himself, added that fortunately so far in Russia there is no binding regulatory law in the field of culture. Many people still cannot forgive this “freedom of speech within the law” of the great Russian poet, but what if “the Russian people are so responsive and sensitive to everything that is happening in the world of culture”? The Syrian issue is in the spotlight, and again the Chatham House rules. In recent years Russia dealt with peace settlement in Syria. Its policy in the region is not only an example of major military-political and diplomatic success, but also an example of how a country can actively and positively influence the construction of the world order. Experts noted that Russia has a “good reputation” in the Middle East. The Russian military police are perceived in Syria as an impartial force. A lot of players observe the situation in Syria. Russia has already invested a lot in its restoration, but it expects that Western countries and the Gulf states will join this process. China would be the ideal sponsor, but apparently it is not ready yet. Moreover, there is a rich Syrian diaspora (only in Brazil several millionaires are of Syrian origin), but it is not in a hurry to risk money. However, the situation may change if stabilization occurs in Syria. This implies the restoration of its political structure. The international community must provide the conditions according to the will of all Syrians. Nevertheless, as one expert rightly noted, it is impossible to achieve stability in Syria without achieving stability, for example, in Iraq and Lebanon. There are many problems in the Middle East, and one needs to work out a comprehensive solution to solve them all. 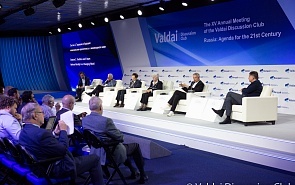 From the Middle East participants in the Valdai Club Annual meeting turned to Eurasia. The final session of the second day of the meeting was also held according to the Chatham House rules. One of the speakers at the session said that Eurasia in its understanding is a special space with harsh climatic conditions, where undemanding and enduring people live. For example, when a foreigner arrives in Moscow, and the aircraft commander announces that it is minus 25 centigrade outside, the foreigner simply does not leave the plane because it is colder than in the freezer of his refrigerator. In no other region did people suffer so many socio-political cataclysms in just one century: World War I, the 1917 revolution, World War II, the 1990s. What would Confucius say if he lived in an era of permanent changes? “And people sing that “nature has no bad weather ”! Is it possible to intimidate these people with sanctions? ”, the expert asked rhetorically. Nevertheless, when the West today is tightening economic screws against Russia and China, it is important for the countries of Eurasia to develop new relations with each other and with the world community. Of course, China and Russia are united not only by sanctions - they have large projects: the EAEU and Belt and Road initiative, which have confluence and benefit both countries. There is also the Far East, a region of great opportunities for investment, culture, social development and the project of its "transformation into another California." The goal is ambitious - to achieve the pace of economic growth of the Far East, comparable to the leading countries of the Asia-Pacific Region. This, as one of the experts noted, is an important political turn, a previously missing link that is now embedded in the overall chain of the Eurasian relations. But the economic, social and political stability of Eurasia directly depends on security in the region. Experts consider that today the big players do not pay enough attention to it, but they should. The participants of the Valdai Club session presented a new Valdai book on security in the region “Eurasia on the Edge: Managing Complexity”, written by a team of authors led by Piotr Dutkiewicz, Richard Sakwa and Fyodor Lukyanov. Of course, this is not Dostoevsky, but very respected experts, whose work is also worth reading.